Today will be the longest day in 2008. It’s a Saturday evening. It’s the 21st of June. From tomorrow, the days get shorter. The main reason I’m sitting down to write this blog is to pause time for a while, to stop another month from going by without recording anything about the ongoing saga that is Whitechapel Boys. There is good news. A section of the project is going to be published as a booklet, a monograph, a kind of chapbook as part of a series on War Poets. We haven’t agreed on everything, so I’ll post all the details when we’ve signed on teh dotted line. This will be the Series’ booklet on Isaac Rosenberg and will be about his last days in Arras, before he was killed on the 1st of April 1918. The narrative is woven in with a story about a guy who goes to visit Rosenberg’s grave just as his own relationship is falling apart. It’s semi-autobiographical in that it’s about 3 or 4 relationships rolled into one. The other bit of good news is that I finally printed out the entire Rosenberg section of Whitechapel Boys and I have a feeling that it’s a book on its own, that it needs to be a separate book. I keep changing how I think the book should be structured – all three stories interlinked, three parts of one book, three separate books – but at the moment it feels right that each artist should have a book to himself, because, really, each of them brings up a whole different set of issues. With Rosenberg it’s questions of poverty, of thanatos, of the deperate desire to be published, to be recognised, questions that concern every artist (every human being?) to various degrees throughout our lives. Yet with Rosenberg it comes with early death, with the sense of a thwarted process, or one that has been reduced to an essence. It has been and still is a challenge to spend so much time with Rosenberg, to stay in touch with that part of me that used to be much more like him: driven, miserable and desperate. I wonder if it is a necessary phase to go through in order to discover what the themes of one’s life are, what the questions and dramas are that sit at the core of one’s being. More good news? 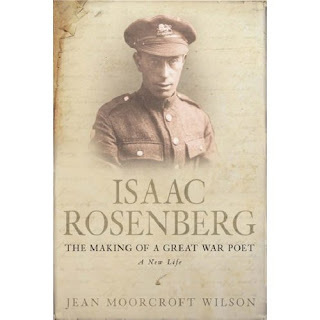 I got to review Jean Moorcroft Wilson’s new biography of Rosenberg (which apparently has gone into its second printing) for the Jewish Quarterly. It’s my second review for the JQ. The first one was about Anne Landsman’s The Rowing Lesson. The good thing about starting to review for the JQ is that I’ve been reading the magazine, and it’s fantastic – it has its head in the right place and its politics are refreshing. The Rosenberg review should be out next month, I think. More good news? I got a short-short story accepted by Clean Sheets. They said it should be out in July. The story is called “The History of Her Tongue.” I’ve been going through stories that I have in my “Stories” file, pieces I wrote years ago, or even recently, but haven’t looked at for a while. I love opening files I’ve forgotten about and discovering these little surprises, intense pieces that I wrote without a plan or an agenda in mind. Often they are stories that start in a workshop I am running or when I’m planning an exercise and try it out beforehand. The Clean Sheets story came out of an exercise I love called “The History of Your Tongue.” Instruction: Write a history of your tongue. Alternative: Write a history of your character’s tongue. Hey, write a history of God’s tongue, of the lion’s tongue, the ant’s tongue, the nation’s tongue. So… I’ve been going through these pieces and trying to finish them up and find them a home. My other goal for the summer – besides finishing the Gertler section as well as the Rosenberg section – is to assemble another short story collection. I guess we’re halfway through the summer. I guess I’d better get back to work. >Gosh, that IS good news. Well done!I just take issue with one thing: I’m looking through the window right now and it certainly doesn’t seem like summer to me.